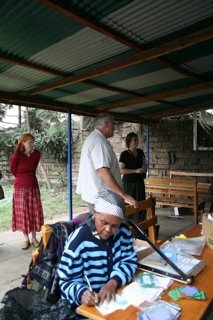 > We started our morning on African time all meeting and leaving our hotel for a quick visit to Kibera slum. We have been selling cards from this project for a couple of years and this was our chance for Susanne and others to check it out. We sang, laughed and shopped as well as encouraged the workers. Here you see them making cards, including making the handmade paper. The Christmas cards were ready for our order so we will be bringing those home with us. 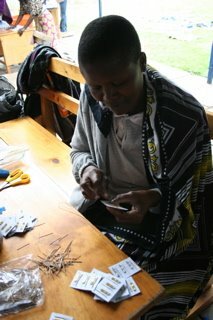 Kibera slum is the largest slum in the world, and in one small part of it lives are being changed one card at a time.